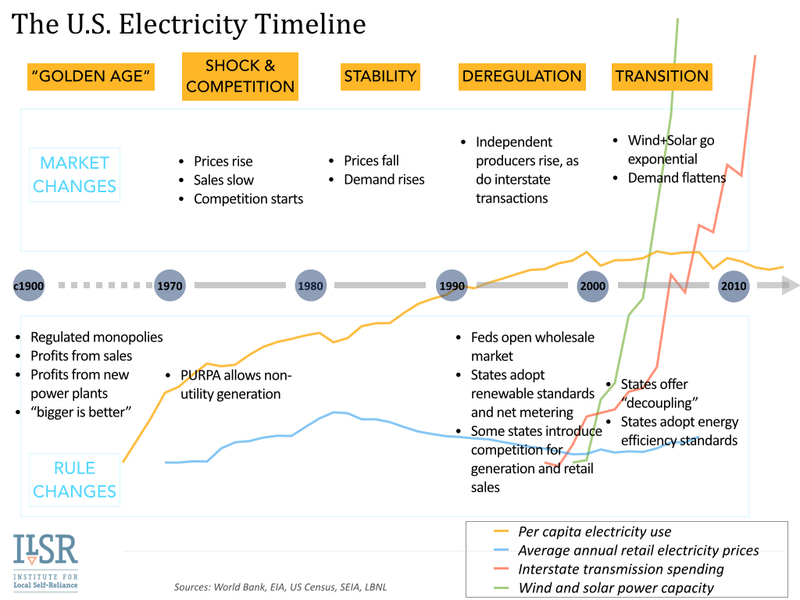 The U.S. electricity system is undergoing the biggest change in its 130-year history, undermining the rationale for monopoly ownership and control. Until recently, electricity service was similar to water or roads, where a natural monopoly was most efficient. Only a single, standardized electric grid was needed to connect each building. Technology options were limited to steam-powered turbines fueled by coal and oil, or large hydro dams with massive economies of scale. There was very little long-distance transmission of power, as each utility was responsible for electricity service within its own territory. Growth in demand was exploding and monopoly utilities could wield the most cost-effective financing for new power plants. These natural monopolies paid off for customers, with falling costs of reliable electricity even as demand rose rapidly. But the 21st century electricity system is radically different. It no longer makes sense to preserve last century’s forms of utility ownership and control in a century where cost-effective technology enables widely distribution production and ownership of electricity. And yet, a majority of state laws governing electricity service still preserve this monopoly model. Even those that do not have made little progress on democratizing the electricity system. There have been incremental changes. In the last three decades of the 20th Century, federal regulators opened the utility market to competition from non-utility generators who used higher efficiency or renewable-fueled power plants and opened the wholesale market to competition by making the transmission system a common carrier. These moves showed that utilities did not have a natural monopoly over power generation and emphasized the public nature of the grid infrastructure by allowing fair and non-discriminatory access. Competition was introduced between big players who could own and operate large power plants. Changes in the 1990s also introduced retail sales “competition” that proved elusive. California’s near-bankruptcy due to price manipulation by Enron and others led many states to freeze or reverse retail deregulation. Even in states where retail competition has been maintained, public advocates warn it has offered little innovation in electricity service (other than promotional rates like offered by the cable industry). More to the point, retail competition does little to empower electric users, who are still just consumers of power. The most potent change has been the growth of conservation and energy efficiency. These tools offer non-utility and cost-effective alternatives to new power plants, and as such, illustrate the unnatural nature of utility monopolies. Many states have shifted to independent, non-utility delivery of conservation and energy efficiency services (e.g. Efficiency Vermont). At the present, however, utilities still maintain monopoly or exercise market power over many aspects of the grid. On the transmission system, for example, planning rules make it very difficult to implement less costly, non power line alternatives to utility power line proposals (see Beyond Utility 2.0 to Energy Democracy, p21). In particular, planning is rarely integrated with distribution level planning, where distribution energy generation (like solar) can serve reliability and energy needs. Distribution planning also suffers from utility monopoly, because as utility expert and former utility manager Karl Rabago says, “utilities simply do not think things they do not own or control can be resources.” Thus, system planning rarely incorporates customer-owned solar, electric vehicles, energy storage, and many other cost-effective strategies for meeting electricity needs. In other words, the natural monopoly has become unnatural, with utility managers wedded to costly legacy infrastructure solutions (like poles and wires) in an era of remarkable local and non-utility resources. New utility power plants and power lines will last for 40-50 years, but distributed energy resources will be competitive well within the lifetime of these legacy investments. For example, by 2022, on-site solar power could provide less costly electricity than the electric utility for at least 10% of residential and commercial customers in nearly every state. In that timeframe, electric vehicles and other energy storage options combined with powerful “apps” will give utility customers unprecedented control over their energy use. 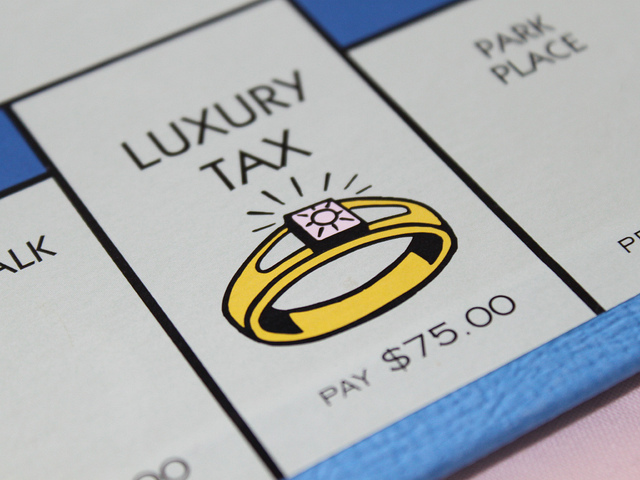 Monopoly is no longer natural or even cost effective. But what will replace it? For one, it must be a grid built on the principles of a 21st century electricity system. 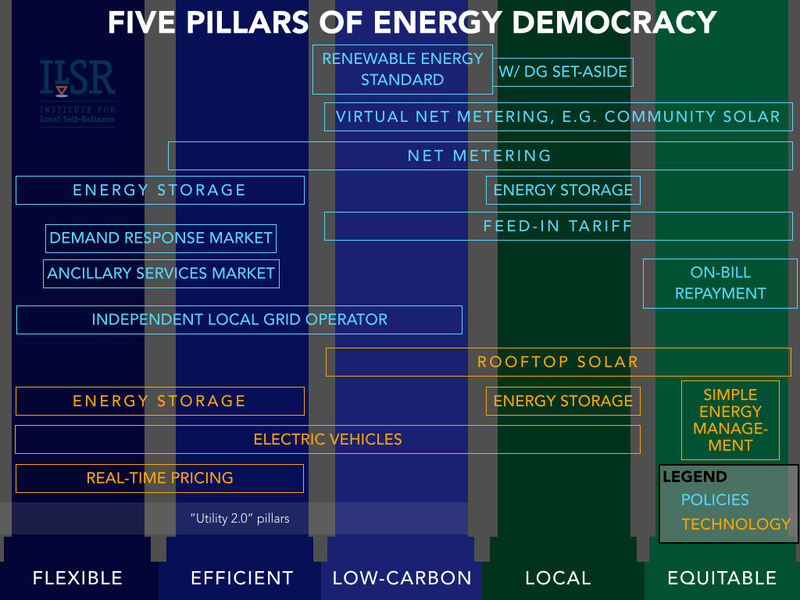 I offer five pillars of a Utility 3.0 model, or energy democracy. Three of these derive from the prominent Utility 2.0 conversation. How will these principles be applied to the end of the natural utility monopoly? On the transmission system, there’s a clear need for policy to re-integrate planning with the local level, where there are many more opportunities for conservation, efficiency, and distributed energy to meet regional needs than ever before. 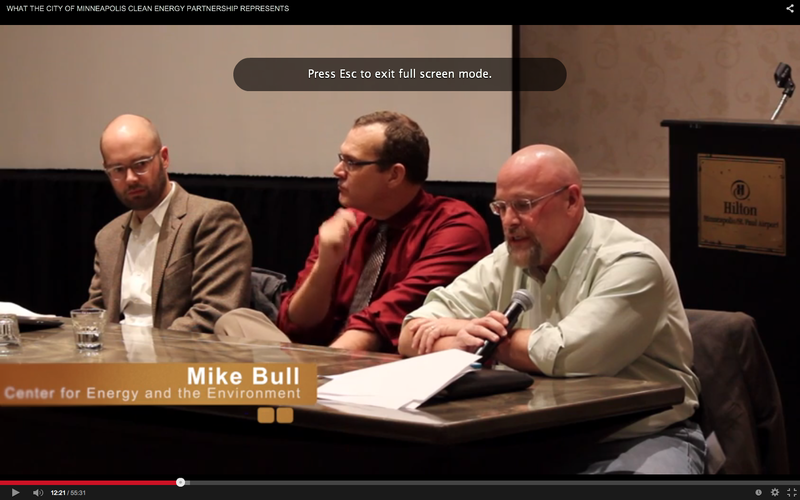 There are a few other suggestions, for federal regulators, in this post. On the distribution system, the answer is new management and, likely, ownership. 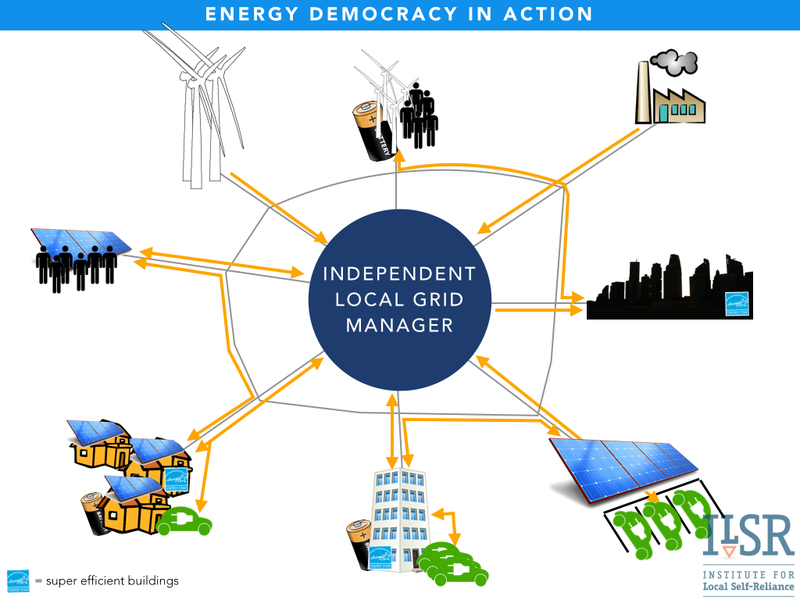 The New York Public Service Commission’s Reforming the Energy Vision process has already outlined a plan for an independent manager for the distribution system, but it may fall short of the necessary steps to make the distribution system a tool for energy democracy. Until the turn of the 21st century, the distribution system was simply the last mile of lines bringing power one-way from utility operated power plants to customers. But now the distribution system can facilitate energy democracy. Individual and community solar arrays can produce local electricity; electric vehicles, energy storage, and smart appliances can manage energy use; networked thermostats and smartphone apps can give individuals and businesses unprecedented power as energy managers. The following graphic provides a very simplified picture. To facilitate this network, the distribution system needs to be a common carrier, with non-discriminatory access to all. But the infrastructure of the local grid (substations, transformers, etc) also has to be vastly upgraded and smartened to enable local ownership and management of energy systems, and the transactions between these local owners. These investments, in the public interest and not the manager’s interest, necessitate complete separation from utility ownership and management as long as utility’s still have a vested financial interest in particular outcomes (e.g. a guaranteed rate of return from building new infrastructure). The grid could be owned as a commons, like the roads or municipal water supply, or not. But it must be built and operated to facilitate maximum economic opportunity for electric customers. Maintaining an unnatural monopoly is inefficient, but failing to correct it is enormously costly. Energy efficiency and distributed energy offer electricity customers $48 billion economic opportunity, and the rules for the electricity system should allow them to seize control. When are we going to see a discussion of third party ownership of DC microgrids coupled with NZE new and retrofitted buildings. Deep energy rerofits and a switch to a DC infrastructure offer major savings in addition to a healtrhier living enviornment. I submit that they also are a better foundation for the “democratization of energy” ILSR has so thoughtfully articulated. Does this even take into consideration that there are actually three types of electric distribution utilities? Obviously this article takes direct aim at the investor-owned utilities. While the ratepayers’ interests should come first, there are some that put the shareholders’ interest first – like one utility in western South Dakota does. They recently tried to get a 26.5% increase (partly to have the ratepayers help pay for a new power plant). Municipal utilities have been around almost as long as the investor-owned utilities, but as they are almost always exempt from utility commission oversight, they are free to raise the rates as they wish. One South Dakota municipal had to raise its electric rates over 60% when they got in way over their heads on a system upgrade project. The newest class of utilities, relatively speaking, are the cooperatives – and in every case, the customers as a whole are the owners of the company. They are run on a not-for-profit basis, any earnings above and beyond operating costs are eventually returned to its members after a set number of years. I would think that if we truly want “local” ownership and control of the electric utility industry, the cooperative model is the one that should ultimately be adopted.